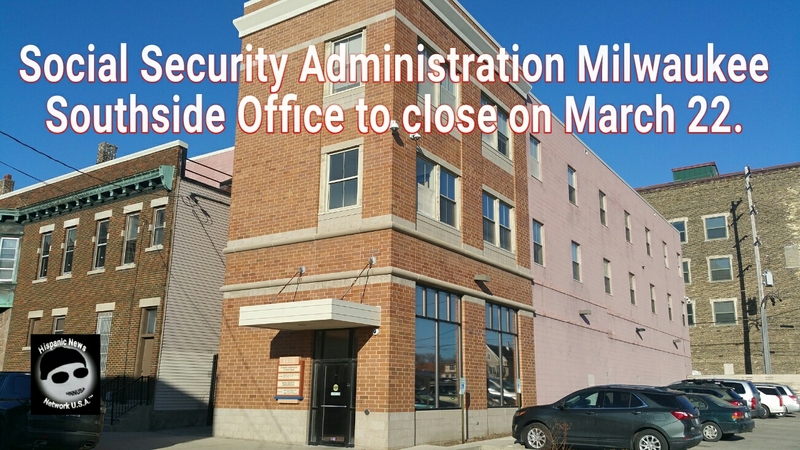 The Social Security Administration is scheduled to close the Mitchell Street field office on March 22 affecting the predominantly Latino community. Milwaukee, WI – On Tuesday, public elected officials including Mayor Tom Barrett held a Town Hall meeting at the Mitchell St. Library to discuss concerns about the decision by the Social Security Administration (SSA) to close its Mitchell field office on March 22, despite opposition by the Southside community it serves. The public elected officials at the meeting were 12th District Alderman José G. Pérez, 12th District Milwaukee County Supervisor Peggy West, Wisconsin State Representative JoCasta Zamarripa (D-Milw.) from the 8th District and City of Milwaukee Mayor Tom Barrett. Barrett says that the community is in a battle to keep a SSA field office in the Southside. He told members of the community that no SSA field office will be in the Southside once it closes, which would be an insult to the community. For the SSA to make vital services harder and less accessible for seniors and those with disabilities to apply and collect those “funds that they placed into the social security system, and to me is wrong,” according to Barrett. According to the New American Economy dot org report, in 2015, Hispanic households contributed $101.8 billion to Social Security and that included the almost $46.2 billion foreign-born Hispanics who contributed to Social Security as well. Once the Southside SSA location is closed, those seeking services would have to go the SSA office at 310 W. Wisconsin Ave. (Milwaukee Downtown) or the City of Greenfield SSA location at 8455 W. Layton Ave., which Greenfield has a population of 37,000 compared to the Southside location that has at least 90,000 in population. Tammy Rivera, the executive director from the Southside Organizing Center (SOC) reported that the SSA reasons provided in a prior meeting about what led to the decision to close the Mitchell Street location was an unsafe building and needed maintenance for years. Finally, the SSA decided to close it by using an exception clause for emergencies due to disasters that allowed not giving appropriate notice to the community affected when closing an office as required. Rivera also explained that the SSA lease on the building expires in May. At least 2,200 clients per month will be effected and none of the them were notified of the closing and there was no plan by the SSA to notify them as well, according to Rivera. Rivera says, when the SSA decides to close a field office similar to the one in the Southside, it saves them money because 11% less claims are filed. Rivera claimed the SSA was engaging in a discrimination practice against a population. Alderman Pérez told the meeting participants that the SSA had also claimed that crime was an issue in the Southside field office, but a Milwaukee Police Department report indicated no crimes had been registered at the 1710 S. 7th St. address compared to other SSA field locations, which were considered worst. The SSA had mentioned that the elevator had issues operating, but according to Pérez, the elevator has passed elevator inspections on a yearly basis. Darryl Morin representing a local LULAC Council says that Latinos should have access to the SSA services as well, but the closing of the Mitchell St. SSA office denies them access. It is reasonable to determined that the SSA has failed to justify why a decision had been made to close the Southside Mitchell St. field office, despite getting an offer from Mayor Barrett and Alderman Pérez to relocated to the former Forest Home Library location which has plenty of space and parking. The SSA has not taken up the offer, but it suggested that virtual stations would open near by the area without giving any further detail, according to Rivera. SOC reported that only 13% of persons surveyed would use online services. Apparently, there is 1% fraud with online use, which has been estimated to be as high as $78M dollars. A back deal has been in the works with at least the Hispanic Chamber of Commerce of Wisconsin in Milwaukee, one of the community’s least trafficked organizations and not even a social service agency for a virtual service express office. The community sentiment is this was not a transparent, inclusive, or effective process and we are not in support of this option. We believe it is a discriminatory and are examing SSA action in similar communities across the nation, to impoverish and minority communities and particularly Latinos, Rivera says. Alderman Pérez at a press conference did say that a SSA office in the Pilsen neighborhood in Chicago, which is also predominantly Latino had closed as well. In this case, the SSA has simply and blatantly decided to target the predominantly Latino area by denying services to its elderly and people with disabilities affecting a diverse population as well who decided to live in the area. A American Federation of Government Employees (AFGE) union member says that employees at the Mitchell St. location confirmed that the field office has been considered as one of the best SSA service providers in the area and that people from other locations seek services in the Southside office because of easy access, parking and good service. The Southside SSA has served the community for 40 years. SOC also announced that there will be a filing of Freedom of Information Act request regarding the decision to close the Mitchell St. SSA field office. It wouldn’t be a surprise to anyone today that the Trump administration is targeting Latino communities and disenfranchising the elderly and those with disabilities as a blatant discriminatory practice, which fails to justify the closing of the Southside SSA office, while maintaining two SSA offices in the Northside of Milwaukee and two other offices in White predominantly areas, which includes Downtown Milwaukee and the City of Greenfield. Smh, time to use the race card, it is evident that the Latino community in the Southside is targeted for discrimination and other diverse populations in the area have definitely become victims as well for choosing to live in the area. The U.S. Congress has borrowed billions of dollars from the SSA and doesn’t want to pay it back, so they have engaged in action to cut more than $1.5B from the budget and are looking to do away with vital services by cutting funds. Shame on Congress and the Trump administration for advocating cuts of services by targetting and shutting down SSA offices in predominantly Latino communities, which the Southside SSA office in Milwaukee’s predominantly Hispanic community has become the first one to close down and next will be in the Chicago area. 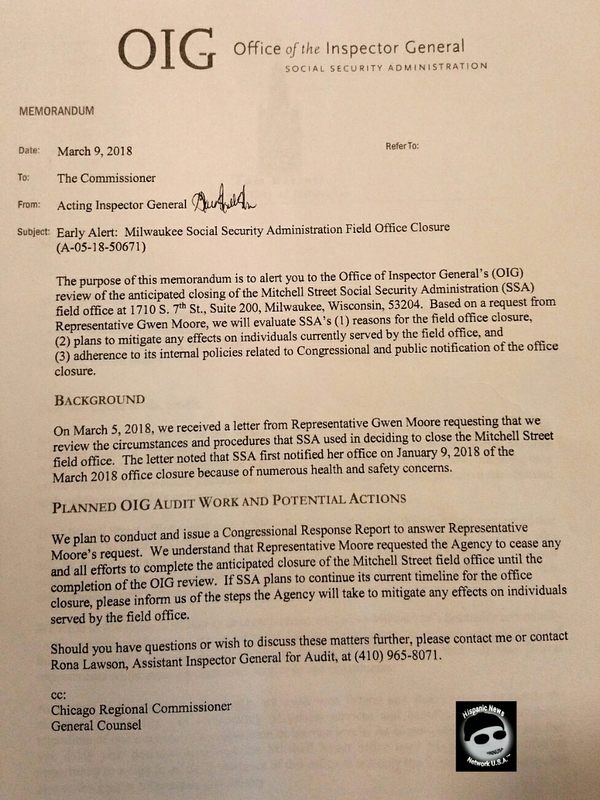 The AFGE Chicago Region Council 220 in February released the following report, We learned that a Social Security field office in Paul Ryan’s neighboring district (Milwaukee) will be closing this year. Instead of cutting field offices, we should be expanding them! Social Security’s administrative costs are so minimal that these cuts do nothing to extend the life of the trust fund. This is our money, and Republicans in Congress are forcing administrative cuts for no reason other than to make people lose faith in our Social Security system. 10,000 baby boomers are turning 65 each day, we need more Social Security field offices, not less! Cuts to Social Security field offices will undermine our ability to make critical decisions about our retirement security. It will result in long hold times on the phone and longer wait times at remaining field offices. 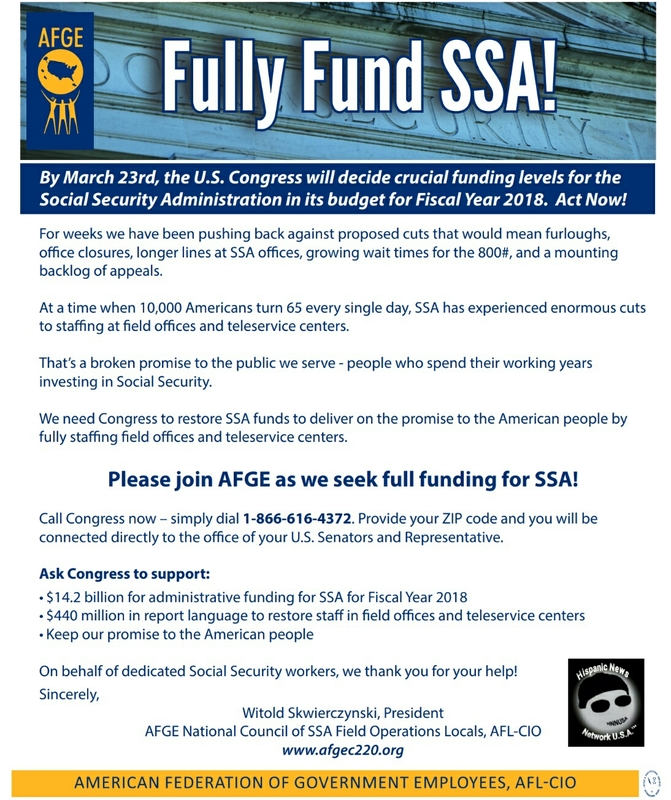 We demand that Congress act to expand, not cut, Social Security field offices. 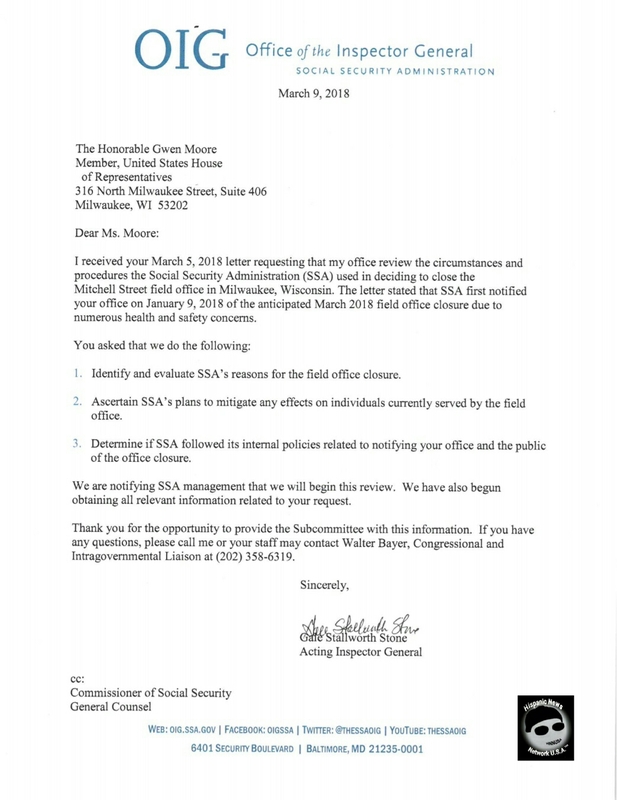 Congresswoman Gwen Moore (WI-04) requested an investigation into the decision to close the Mitchell St. SSA field office in Milwaukee and Moore released a letter dated March 9, 2018 from the SSA Inspector General announcing a review has been launched, despite the March 22, 2018 closing of the field office in Milwaukee’s Southside. This entry was posted on March 21, 2018, 8:19 am and is filed under Uncategorized. You can follow any responses to this entry through RSS 2.0. You can leave a response, or trackback from your own site.